These sixteen linked short stories take place in Egg Rock, a fictional seaside town north of Boston. Egg Rock may be a small town, but this is not a small town book. The events that unfold there over hundreds of years—allowing for culture, climate and geography—could have occurred anywhere else on the planet. I was brought up in that part of the world and, in spite of spending most of my life elsewhere, continue to be intrigued by its people, its history and its raw beauty. As these stories took shape, I wasn’t surprised that Egg Rock had become the principal character. Although some of the stories are based on local legends or actual historical events, this is a work of fiction. As readers work their way through the collection, they will encounter unexpected connections between characters and events. Coincidence, kinship and happenstance move the action forward and by the concluding piece, Egg Rock will have made a profound impression, for better or for worse. 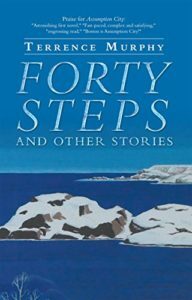 Forty Steps and Other Stories has received a Star review from Kirkus, here is an excerpt of the review.